The Miltenyi Biotec gentleMACS Dissociator provides semi-automated dissociation of tissues in a compact easy to use benchtop instrument. This homogenizer helps lab achieve dependable reliable results through Single-cell suspensions for use in cell separation, cell analysis, and cell culture. 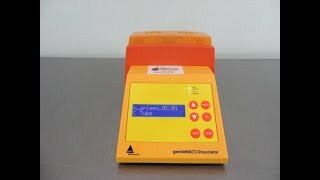 The gentleMACS Dissociator can also be used to extract biomolecules for molecular biology or protein biochemistry applications through the homogenization of cells and tissues. The gentleMACS Dissociator comes with standardized procedures for gentle dissociation, for a single sample or two samples at the same time. This dissociator operates with two types of tubes for either dissociation or homogenization of tissues in a closed system and is an ideal choice for work with tumors, neural tissue, muscle or liver, and for total RNA or mRNA, protein extraction, and mitochondria isolation. This Miltenyi Biotec gentleMACS Dissociator has been fully inspected and is performing to expectations. All of our lab equipment comes backed with our standard warranty. Should you have any questions, please don't hesitate to contact us.